A sudden rain shower in Friday afternoon soaked the concrete track at Dover International Speedway, forcing cancellation of the Monster Energy NASCAR Cup Series knockout qualifying session. As a result, the field for Sunday’s race was set according to owner points. On the pole for the first event of the Round of 12 playoff race will be Kyle Busch of Joe Gibbs Racing. Kevin Harvick of Stewart-Haas Racing will start on the outside of the front row, and the remaining 10 playoff contenders will line up in owner-points order on rows two through six. Busch thought the rainout was a net positive for his No. 18 Toyota, in terms of potential spots gained. 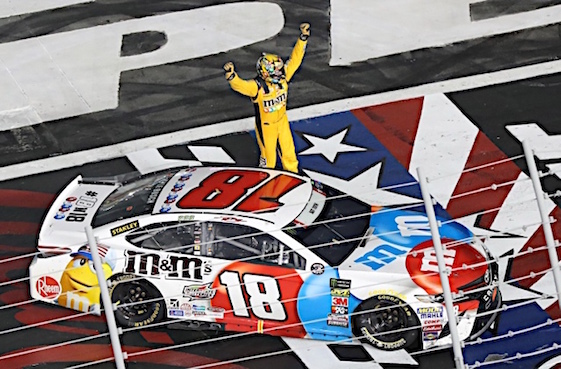 “Probably six or eight spots or so, I believe,” Busch said. “It definitely bodes well for us. I thought we had a decent car in practice, the way that it felt—it felt pretty good. It just didn’t show the speed on the speed chart. Martin Truex Jr. will start from the third spot next to Brad Keselowski. Only 15 points separate fifth-place starter Clint Bowyer from 12th-place Alex Bowman, with the next three races set to determine the drivers who will advance to the Round of 8. Busch, on the other hand, has a 47-point edge over ninth-place Chase Elliott, who was fourth fastest in Friday’s opening practice behind Kyle Larson (10th in the Playoff standings), Harvick and Kurt Busch (seventh). NASCAR also postponed Friday afternoon’s scheduled K&N Pro Series East Race until 9 a.m. Saturday.